The Amphicar, launched at the 1961 New York Auto Show, would be the world’s first mass-production amphibious car and was designed by Hanns Trippel. History suggests that Trippel, a racing driver turned engineer and manager of Bugatti’s Molsheim, France plant during the German occupation of WWI, was obsessed with creating a viable water/road-going combination. It is said that over a thousand prototypes were built before the Amphicar was successfully launched. The Amphicar would see production between 1961 and 1968, with a total of approximately 4,500 units manufactured during that time. Of these, it is estimated that approximately 3,046 of these were sent to the United States. With a top speed of 7 knots on the water and 70mph on the land, the Amphicar was often dubbed the “Model 700.” All Amphicar models are convertibles, with four original colors: Beach White, Regatta Red, Lagoon Blue and Fjord Green. If you’re the proud owner of an Amphicar and are thinking about selling, the Alex Manos team is delighted you’ve found their website. Filled with Seller’s Tips and resources about the Amphicar brand, they’ve compiled all the information you need for a successful sale in today’s classic car market. Even when brand new, the Amphicar was considered mediocre as both a car and boat, yet they were well loved. 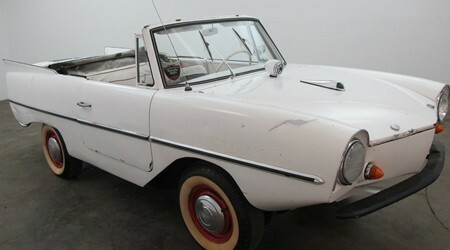 As an owner of an Amphicar, you understand the unique appeal these cars have to collectors and the fun that they can offer their owners. When deciding to sell your Amphicar, buyer will certainly be concerned with the car’s overall condition – including whether or not the car is seaworthy. It is also well known that Amphicar models require quite a bit of maintenance and tinkering. If you have documentation regarding ownership history, maintenance, service and restoration, these items can be very helpful in giving buyers a glimpse into your car’s history. Similarly, it is not unreasonable for serious buyers to want a third-party inspection, as they will need to be fully aware of what they are purchasing. You should always try to accommodate an inspection if at all possible. These are just a few of the Seller’s Tips that the Alex Manos team of professionals have learned over their years of experience in the classic car market. To learn more, connect with their team today. A Los Angeles classic car dealership with a reputation for fair and honest car deals, the Alex Manos team is always in the market to buy classics of all makes, models and conditions – including the Amphicar. In fact, should you classic Amphicar fit into their collection, they will happily make you a top dollar offer in cash on the spot and will pick-up from any location in the country. The entire transaction often takes just 48 hours from your initial all. Learn more. Connect with their team today!